I'm flashing back to 1998. My daughter was eight years old, my son was nine. Guess what they wanted for Christmas? If only all they wanted for Christmas was their two front teeth. But no. They had to have Furby. That was the beginning of a long rein of terror in our home. Those two Furbys learned to speak our language quickly, not exactly fluent English but they were able to get their point across - they were in charge. I shiver at the memory of those long ago nights after my kids went to bed. 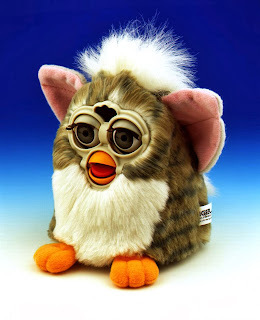 That was when those Furbys really came alive and terrorized me with incessant demands for attention. Who knew where the kids had left them to work their evil - sometimes one would be lurking in the family room or the kitchen or...or in any room in the house. And the worse part, the absolute most horrifying part was that they had NO OFF button. Really, it's true. What crazy person would create something like that! Well, those days are behind us. 40 million Furbys later, I've learned that they have been resurrected from the dead. 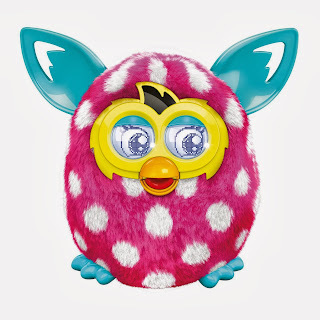 A new generation of Furby is on the move, plotting to take over control of our lives, this time possibly forever. And they are cuter than ever. What innocent child could resist this tempting little number? Just imagine if you will, today, fifteen years of more advanced technology. I don't want to thing about what Furby is capable of. And I suspect this one, like its predecessor, doesn't have an off button either. Do NOT let this 'thing' into your homes. Last year this is all my Goddaughter wanted for Christmas, so I bought her a furby (stuffed animal); my best friend asked me why I bought her a stuffie so I just told her get your hands on the real deal and you will have your answer, and by the way your welcome! I am glad I didn't have those things when I was young. Haha, Lynn, you are a great friend! Me too, Candace. Easy Bake Oven was my big wish. THEY WILL NOT DIE!!!! The batteries in my flashlights last for six months, but not the ones in the Furbys, no — they have been going since 1998, and they can still be set off if you run into one. No one remembers how to get them to shut up now (there's the holding the eyes part, but that doesn't always work). My cleaning person was guilty of this a couple of months ago, I told him the rule was, if you set it off, you have to make it stop. He's from Guatemala, he had no idea. Oh, my, gosh, Joni, you win for surviving terror the longest! Those things are worse than a Chucky doll or a room full of clown dolls! I have often wondered how many Furby's are in the land fills and still going? geez, Jeannie, I don't want to think of them underground, still functioning! I was always afraid that if I removed the battery it would keep going anyway!!! I'm glad they weren't around when my kids were young. I remember that strange little faces in stores. Creepy looking. .....shudder.